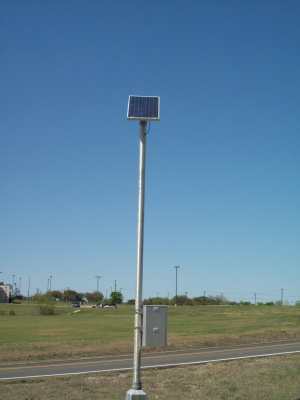 Pole-mounted solar power systems feature an array of solar panels that are mounted on the top of or on the side of a pole that is set in the ground using a sufficeintly-engineered concrete footing. These industrial-grade solar kits range in size from 10 watts to 375 watts and feature durable, high-quality components that carry various long-term performance warranties. Each kit includes one or more solar panels, a controller, a side-of-pole mount, and included cables. Additional options include solar panel upgrade, batteries, and battery enclusures. These pole-mounted solar power kits are the perfect solution to your remote power needs for applications such as scientific, government, and military remote sensing, telecom, traffic signalling and control, and oil and gas flow monitoring and telemetry. We at Online Solar, LLC, and Mr.Solar.com have 4 decades of solar energy experience and service to the U.S. Military and the U.S. federal government, as well as from the academic and science communities. Our PMK series pole-mounted kits are also very popular with the oil and gas industry, with our kits powering flow monitoring and telemetry on pipelines around the world. We also have extensive experience working with state Dempartments of Transportation, which has made our DOT solar power relationship a lasting success.